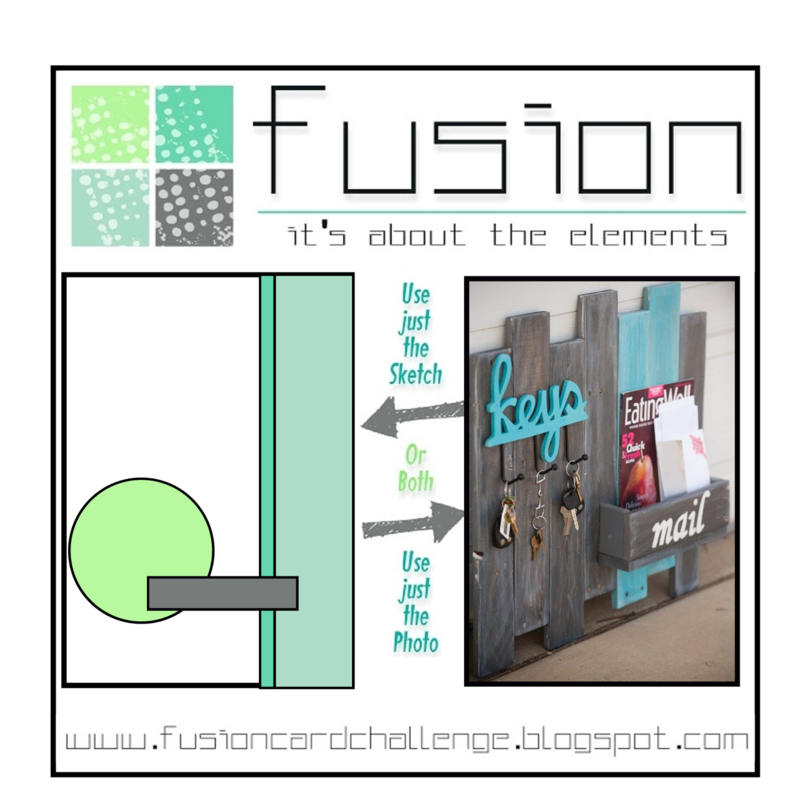 This is the final day to enter the Pin-Sights challenge at The CLASSroom blog by Ellen Hutson. They posted an inspiration photo, and the challenge is to make a project using any Essentials by Ellen product(s) that is inspired by the photo. 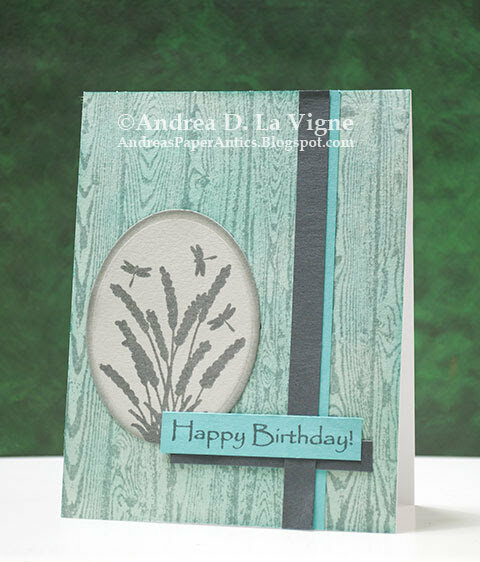 I took my inspiration primarily from the colors and the outdoor photo to create a little birthday scene card. I began by cutting a piece of Strathmore Smooth Bristol paper to 4.25x5.5", to create an A2-size card front. I die cut a mask using a My Favorite Things "Snow Drifts" die (discontinued) and Delicate Surface Frog tape. I applied my mask to the lower portion of my panel, and inked above it with Tumbled Glass Distress ink and the "Mini Cloud Edges" stencil from My Favorite Things. After I had finished the sky, I adhered the other half of the mask over the bottom of my sky, and inked the grass area with Shabby Shutters & Mowed Lawn Distress inks. I stamped the hippo & several of one of the balloon images from "Wish Big" (Essentials by Ellen) onto more bristol paper with Hero Arts Black dye ink. After that dried, I colored the images with my Tombow markers, using a water brush to help blend out the colors. When the paper had dried, I die cut everything with the coordinating dies. After I determined where my hippo would stand, I stamped my greeting (from Essentials by Ellen "Up the Happy") on my background panel, again with Hero Arts black ink. I decided at this point that I wanted another grass layer in front of the hippo. So I die cut one using a Lawn Fawn "Grassy Hillside Borders" die from more bristol paper, & inked it with the same green inks. I glued my hippo in place on my background, and glued the grass in front of him. I decided, since this is a birthday card, that there needed to be another birthday "symbol." So I used the party hat stamp from "Wish Big." I "inked" it with a purple Tombow marker, and stamped it on bristol. I then used the same marker to color it, blending out the color with a water brush. Finally, I added white polka dots with a gel pen, die cut it with the coordinating die, and glued it on top of the hippo's head. To create the bunch of balloons, I first laid them out on the background (without gluing them down) to determine a good distribution of colors. Then I glued the bottom/back-most one to my background. I poked a hole through the paper at the base of the balloon, and threaded through some black thread. I taped one end to the back of my panel, and trimmed the other end long. I poked another hole under the hippo's tail, and threaded the other end of the thread through that, so it looks like the balloon is tied to the tail. I repeated this process for each remaining balloon. Finally, after I had threaded all the lengths through the hole under the hippo's tail, I taped those ends to the back of my panel and trimmed off the excess. I adhered my card front to a white A2-size card base, and glued googly eyes on the hippo for some added fun. The Cards for Little Hearts Card Drive for Heart Month (February) is going on now. I created this card to send in to that. If you are interested in donating, please feel free to visit their guidelines page at their website! I got my inspiration for the card from this one that I found through Pinterest. I liked the general layout and the punch art. One of the requirements for cards for the Cards for Little Hearts card drive this time around is that they have at least one heart on them. So I used a heart punch & dies to create my fish and the accent hearts. I used a heart punch from Marvy Uchida for the bodies of my fish. I used one of the Little B "Hearts" dies for the tails & the 2 accent hearts. I punched/die cut my hearts out of patterned paper (Recollections "Paddywack" 6x6" paper pad), and adhered them to white cardstock. I fussy cut around all the hearts, leaving a tiny white border. This was especially important on the ones for the fish, to keep them from visually blending together. After I glued the hearts together for my fish, I adhered them to a panel of pale grey cardstock that I had cut to 6.75x4.75". I also added the patterned accent hearts to the lower corners of the panel. I die cut a tiny heart from pink felt, using one of the dies from Essentials by Ellen "All Inside," and glued it between the fish. I chose a greeting from Lawn Fawn's "Fintastic Friends" stamp set that is both encouraging and goes well with my fish theme. 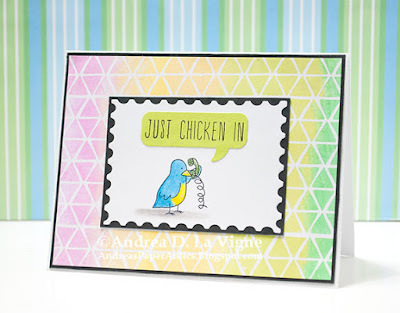 I stamped that in Lawn Fawn Guava ink. I also stamped a few bubbles from the same set with Guava, just to reinforce the idea that these are fish. After I added googly eyes to the fish, I adhered my panel to a white A7 card base. 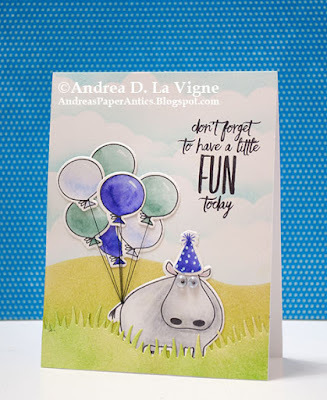 Simon Says Stamp Wednesday challenge: "Add a Sentiment"
Dies R Us Challenge #89: "Kids Kards"
I am so happy to be guest designing for Send a Smile 4 Kids today! 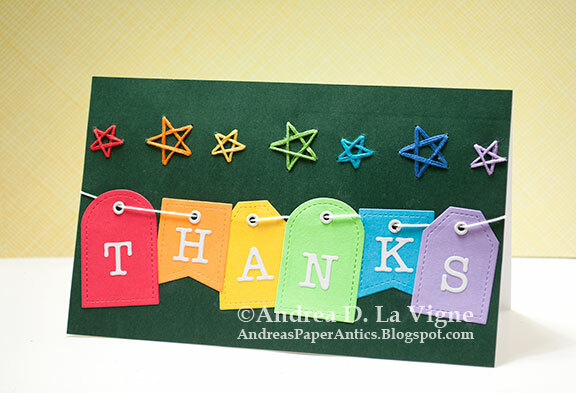 The challenge theme there this time around is "Thank You Cards 4 Kids OR Anything Goes 4 Kids." Simply create a child-friendly thank you card--or any sort of card for a child--and enter at their blog! I got my inspiration from this card I saw on Pinterest. Although the one in the photo appears to be A2 size, I had to make mine A7 to accommodate the Pretty Pink Posh "Mini Tags" dies I used. I die cut 6 tags from rainbow colors of cardstock. I also die cut the letters to spell "thanks" from white cardstock backed with Stick It adhesive, using Hero Arts' "Alphabet Uppercase." I adhered the letters to the tags, being sure to keep them in rainbow order. I used my Crop-a-Dile II Big Bite to punch a hole in each tag, and set a white eyelet, to echo the white letters. Before I glued my tags in place, I decided the card needed a little something extra to fill in the space above the tags. So I pulled out my We R Memory Keepers Sew Easy tool. One of the attachments I have pierces holes for stars, which I thought would be perfect. And, it just happened to make 7 stars along my panel--great for the 7 colors of the rainbow! After piercing the holes, I stitched the stars with embroidery floss, again going in ROY G BIV order. I cut a length of white crochet twine, and threaded it through the eyelets in my tags. I glued each tag in place with Perfect Paper Adhesive, at wonky angles and overlapping each other. I taped the ends of the twine to the back of the panel with little pieces of Scor Tape, and adhered my card front to a white card base. Today is the last day to enter the Fusion 4th Anniversary Card Challenge. I went with both the sketch & the inspiration photo for my card. I need a few birthday cards for February, so I figured I'd get a head start. One that I need in particular is for a guy, so I decided to use a couple of images in the "Serene Silhouettes" stamp set from Sweet 'n Sassy Stamps for my image. After I die cut an oval with a Spellbinders "Classic Ovals LG" die from some Simon Says Stamp Fog cardstock, I stamped my image on that with Hero Arts Charcoal ink. I was going for a softer look to go with the weathered wood in the photo, so I didn't use black. For the background, I stamped the My Favorite Things "Wood Plank Background" onto a piece of Canson XL watercolor paper that I'd cut to 4.25x5.5". I used Hero Arts Soft Granite ink to stamp, and then blended on some Hickory Smoke Distress ink. It didn't give quite the look I was after, though, so I went over the whole thing with Peacock Feathers Distress ink, using a very light hand. I like how it still has a weathered wood look, but contrasts with the other elements on my card. To make my image stand out just a bit more, I inked around the edges a couple of times with Hickory Smoke. I adhered that to my card front, allowing room for a greeting and accent strips. 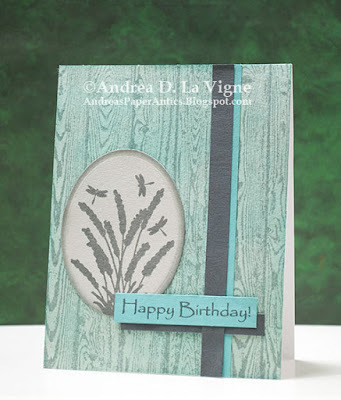 I stamped a greeting from Sweet 'n Sassy Stamps' "Happy Birthdays" onto a strip of teal cardstock. I again used Charcoal ink, but double-stamped this time to get a little darker impression. I trimmed the strip to be a bit longer than the greeting. I also cut a teal strip to 0.5x5.5", and a slightly narrower dark grey strip. I cut another strip of grey to go under the greeting. I adhered the teal to my cardstock, the shorter grey strip over that, then the longer grey strip, and finally the greeting. I'm not sure in the end that the overlapping order matters much, but I think it still adds a bit of texture. To finish, I adhered my card front to a white A2 card base. I'm also entering my card in 613 Avenue Create's Challenge #205: "Anything Goes" (not playing the optional twist). 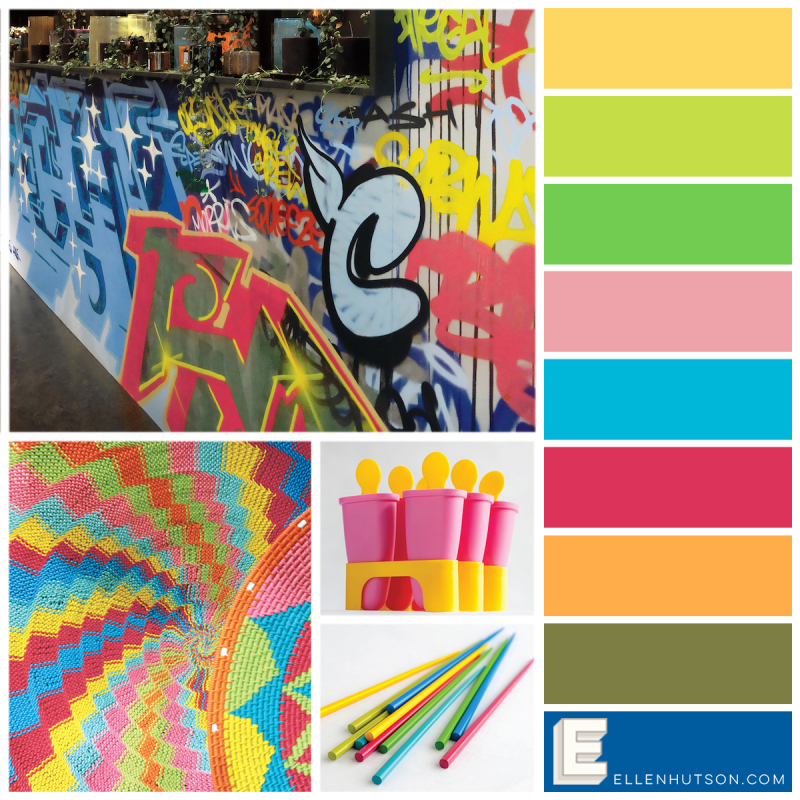 Ellen Hutson is having their January Mix It Up challenge on their blog. This month, they are partnering with Concord & 9th. The object is to make a project using Essentials by Ellen and Concord & 9th products. I created this Valentine's Day card to send to Send a Smile 4 Kids. I used Sketch #SC570 from Splitcoaststampers.com as the inspiration for my design. To begin my card, I die cut the bear from "All Inside" (Essentials by Ellen) from 140 lb. watercolor paper. (This die is solid, so you either have to die cut and then stamp, or create a template to line up the die with your stamped image.) I stamped the image onto the die cut, being sure to wipe the ink from his facial features, since I wanted them to be black instead of sepia. 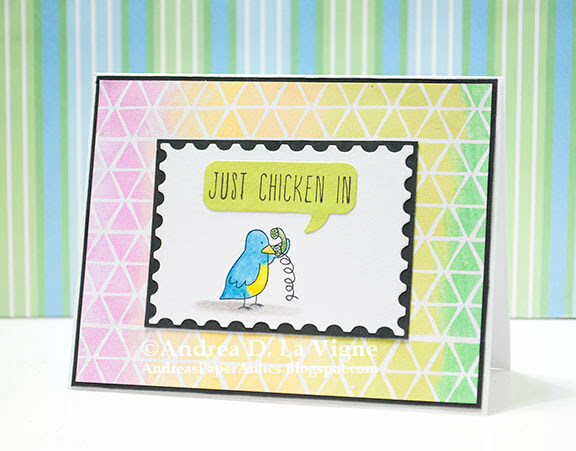 I heat embossed with clear embossing powder, and colored him with one of my Mijello Mission Gold watercolor colors. After the paint had dried, I stamped his face, "inking" up the stamp with a black Tombow marker. I did use a black glaze pen to go over his eyes & nose, and went over the mouth with a fine-tip black Pitt artist pen, just to darken them up more. To create the background, I die cut a piece of Canson XL Mixed Media paper with the scallop rectangle die from Mama Elephant's "Femme Frames" set. (This is no longer available individually, but is part of a packaged set.) I inked the panel with Candied Apple, Abandoned Coral, & Worn Lipstick Distress inks, creating an ombre effect. Finally, I splattered my homemade Perfect Pearls mist on the panel, and blotted the water up with a dry cloth to add some interest. After stamping the "Tree Ring Background" from Concord & 9th onto Essentials by Ellen's 40 lb. vellum, I heat embossed with Recollections Snow detail embossing powder. I fussy cut around the image, leaving a narrow border. 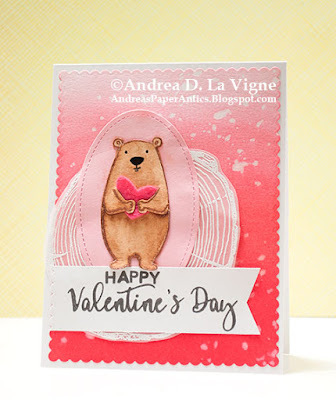 I also die cut an oval from pink cardstock with a Lawn Fawn "Large Stitched Oval" die, to adhere my bear to. I glued a die cut felt heart (cut with a die from "All Inside") in the bear's arms, and then glued him to the pink oval. I adhered the vellum piece to my background, being careful to apply the ATG tape behind where the oval would go, to hide the adhesive. Then I adhered my oval over that. For the greeting, I used Concord & 9th's "Perfectly Penned" alphabet stamp set to spell out "Happy Valentine's Day" on a scrap of white cardstock with Delicata Black Shimmer ink. After the ink dried, I cut that into a banner, die cut the left edge with the "Femme Frames" die I'd used for my background, and adhered it to my panel, tucking the top of the strip under the bear's feet. The only thing left to do was adhere my panel to a white A2 card base, and this card is ready for a hospitalized child to give or receive. 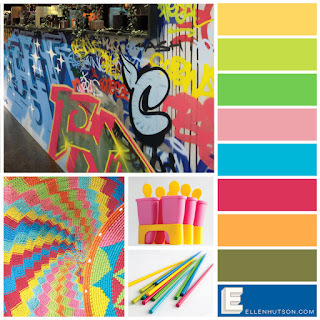 Send a Smile 4 Kids' "Anything Goes or Valentine's/Love Cards 4 Kids"
613 Avenue Create: "Anything Goes"
Dies R Us: "Anything Goes"
The mood board for the current Ellen Hutson Pin-Sights challenge is all about wild colors! While I used many of the same colors, I went with a little lighter version for my card. I began with the background, using one of the stamps from the Essentials by Ellen "Wonky Backdrops" set. I cut a panel of white cardstock to 5.25x4", and used a makeup applicator to ink up part of my stamp with Hero Arts Bubble Gum ink. I inked the other side with Memento Cantaloupe, and stamped on my panel. I repeated the process with Memento Dandelion & Pear Tart; and Delta Emerald dye inks, going in basically rainbow order to create a gradient. I did the whole process 2 more times to finish filling in the panel. For the image panel, I first cut another piece of white cardstock with a Hero Arts "Postage Stamps" die. I stamped the bird from the Essentials by Ellen "Twelve Days" on that with Hero Arts Black dye ink, and colored it with my Prismacolor colored pencils. I used Gamsol on a paper blending stump to blend & smooth the colors. The greeting I wanted from "12 Days Companion Greetings" (discontinued?) fit perfectly on one of the "Delightful Day Conversation Bubbles" dies from Taylored Expressions. I first inked a piece of white cardstock with Pear Tart, using the direct-to-paper method. I stamped my greeting in black onto that, and die cut it. I then adhered that in place on my focal panel. I matted my image panel with black cardstock, leaving a 1/16" border on all sides. I adhered that to my stamped background, and matted it with black as well. Finally, I mounted my card front to a white A2 card base. 613 Avenue Create #204: "Anything Goes"